Within the TEMIS project, work is currently under way to develop a combined retrieval/modelling approach using three dimensional chemistry-transport model calculations available at BIRA-IASB (BASCOE) to provide a more accurate derivation of tropospheric BrO columns from GOME. The principle of the approach is illustrated in the figure below for a monthly-average map of BrO on March 1997. 3D CTM simulations (here from the SLIMCAT model) are used to estimate the stratospheric column of BrO which is subtracted from the measured total column to leave the tropospheric column. The algorithm takes into account necessary parameters like differences between stratospheric and tropospheric AMFs, ground albedo, topography and GOME viewing geometry. In the future, assimilation of stratospheric BrO profile measurements by e.g. SCIAMACHY onboard ENVISAT will be considered as a further step in the algorithm development. 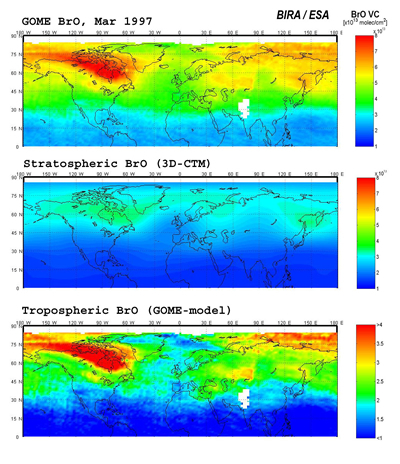 Total vertical column of BrO over the Northern Hemisphere for March 1997, derived from GOME measurements (upper map), stratospheric BrO column from the 3D-CTM SLIMCAT (middle map), and estimated residual tropospheric BrO column (lower map).